Paul’s background has been in the delivery of ecological impact assessment and mitigation work associated with major infrastructure projects for clients including Highways England, Transport Scotland, Transport Northern Ireland and HS2. He has also led an ecological team in India which provided geospatial data management support to ecological project work in the UK. Paul has worked as an ecological consultant for 12 years, joining the profession after gaining a PhD in aquatic ecology. He is a full member of the Chartered Institute of Ecology and Environmental Management, a Chartered Environmentalist, and holds licences for great crested newts and barn owls. 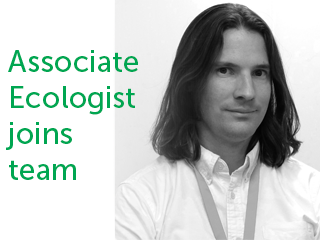 He specialises in Geographical Information Systems (GIS), and will be helping to develop the ecology team’s capabilities in this area. Damian Robinson, Executive Director, heads up the Environmental Planning department in which Ecology sits, and says, “It’s great to have Paul join the team. His extensive experience will certainly go a long way to supporting the ongoing growth of the Ecology department”.